Yup, it’s (been) that time of year again—Sydney Writers’ Festival and the many and varied events that go along with it. It’s a busy time of year for me—made slightly less so by the fact that the NSW Premier’s Literary Awards dinner didn’t happen this year, and also by the fact that I piked on the opening night party, which I remain sad about (I could possibly have embarrassed myself by gushing all over Jeanette Winterson if I had gone) but sometimes you just need to stay home and hunker down with the kitties. On the other hand, it was made a madder time for me by the fact that the Children’s Book Council somewhat bizarrely decided to hold its bi-annual (that’s every two years, right?) conference on exactly the same weekend as SWF. And so, sensibly, my friends at the Centre for Youth Literature in Melbourne decided to hold a round table discussion about literature programming for young people on the eve of the CBC Conference. And so although I wasn’t able to go to Adelaide for the CBC, because of my commitments to SWF, I did go make a flying overnight 24 hour turnaround visit to attend the CYL roundtable. Have you had enough acronyms yet? So yeah, crazy busy. But well worth it. And these things do have a way of working themselves out. Take for example the fact that I am usually committed to MCing the SWF School Days in Parramatta and Penrith in the week leading up to the main Festival, which in the usual way of things would have meant that I could not have gone to the CYL Round Table. However, as the obnoxious and pretty well worse than useless NAPLAN tests were held in that week, the schools’ days were pushed out until the week after the Festival, so I could do all of the above. You follow? What a schedule. 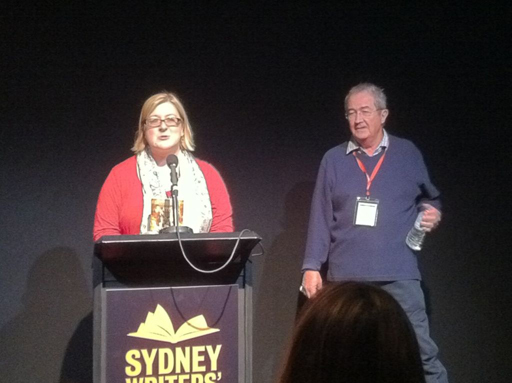 So, this is what my Sydney Writers’ festival looked like: I didn’t see a single panel/session I wasn’t involved in. Bummer. However, I did attend the western Sydney final of The Rumble—the youth poetry slam that The Day Job was involved in, and our awesome kids from Rooty Hill HS won both the team and solo prizes. Go Nicole and FourPlay! The third I was what they call a participating chair, with my dear friend Margo Lanagan and Mette Jakobsen, whose first novel, The Vanishing Act, is a marvel and if you haven’t read it, then get to it. This panel was called Islands of the Imagination, as both The Vanishing Act and Margo’s latest novel Sea Hearts, are set on islands, and share a number of tropes and themes (absent mothers, grief and loss, mourning children, abandoned husbands…) It’s always hard to tell how a panel that you’re chairing is going—I felt a bit rusty on this one, to be completely honest, but people seemed to like it, and M and M had kind words to say, so hopefully it was OK. The schools days, though, are a breeze and a pleasure. I’m sure they’re not a breeze to organise—So Many Logistics!—but as MC, it’s a case of Know Thy Authors and have fun with the audience. I MC the secondary and primary days at Parramatta Riverside Theatres, and the primary school day at the Joan Sutherland Performing Arts Centre in Penrith. It’s not just a fun gig, it’s a good opportunity to promote The Day Job and to talk to teachers in the breaks—I’ve got one potentially very exciting program to discuss with a librarian from one of the high schools in the south-western region of Sydney once I get back to my desk next week. This week. Tomorrow. What a cast of characters! Three lovely women—and me! 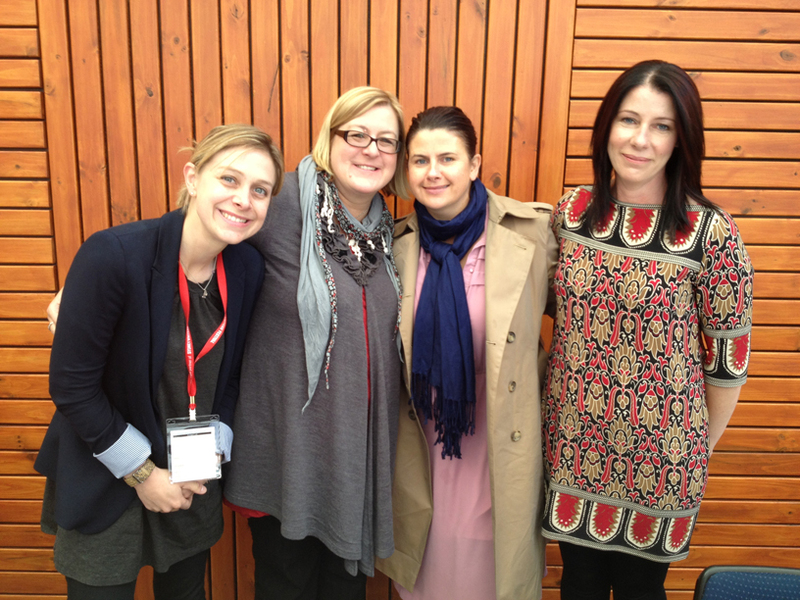 L-R: Lucy Christopher, me, Jane (JC) Burke and Vikki Wakefield. 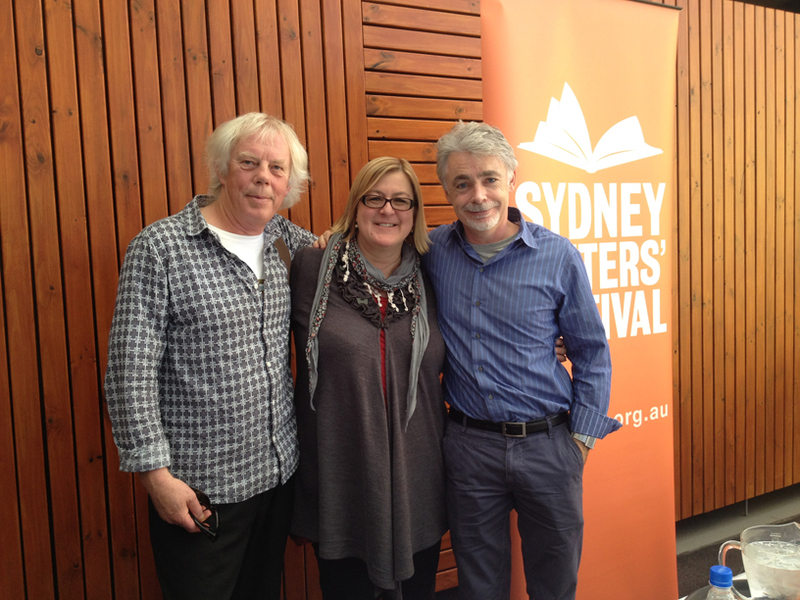 Me in a Mal Peet (l) and Eoin Colfer (r) sandwich. 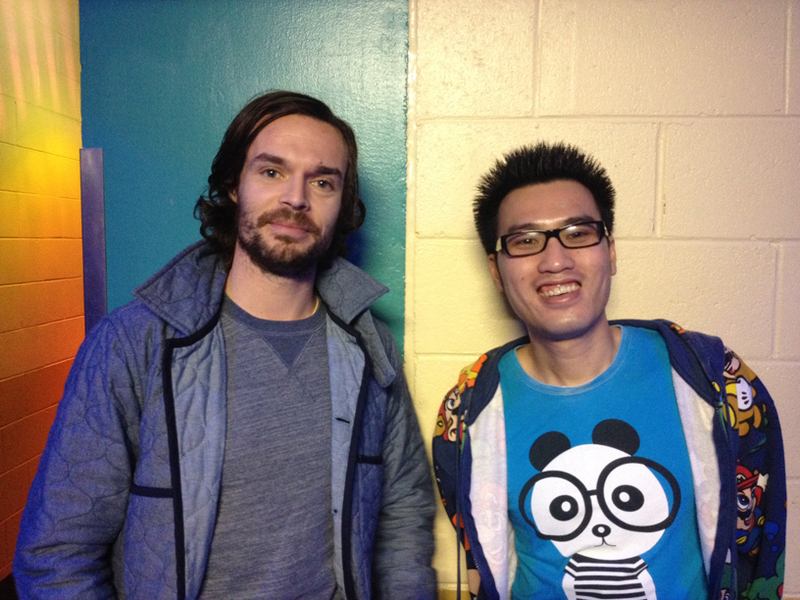 Jeffers (l) and Phommavanh (r). Here Davide is signing a copy of his book Ten Little Insects (a riff, in graphic novel form, on Agatha Christie‘s And Then There Were None [aka Ten Little Indians]) for Susanne Gervay. Davide is also a cartoonist, and he adds a little extra to every signed book. Looking on are Susanne, Wayne Harris, Julie Vivas and Donna Rawlins. 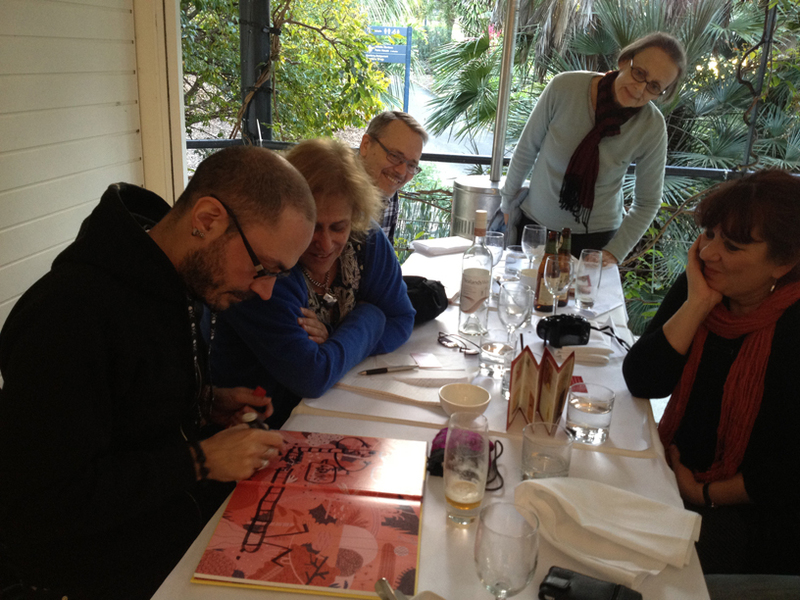 Also at the lunch, but not in the photo, were Davide’s Australian publisher Andrew Wilkins and Ursula Dubosarsky. So, you know, INSANE, but wow, what a lovely way to go mad. Writers, writers (and illustrators!) everywhere—and I wouldn’t have it any other way. Somewhere filed away are the first drafts—rough, meagre things that they are—of my first attempt at writing a thesis for my Masters degree. I was in my late 20s, newly married (though not for long), and desperately in love with the books I was writing about, and the field that I had entered into with all my heart and passion. Like a starry-eyed reality TV contestant, I had thrown in my day job (as a secondary English teacher) and set my course on the wild seas of children’s literature. And it was all, more or less, because of Diana Wynne Jones. I’ve written and spoken many times over the years about how Diana’s novel The Magicians of Caprona changed my life. I’m not going to repeat that story here—you can read all about it in this paper (in fact, I’m going to assume you have), which I gave at the conference dedicated to Diana’s work, held in Bristol in 2009. This post is being written as part of the memorial activity for the first anniversary of Diana’s death, on March 26 2011. Sharyn November, Diana’s great friend and American editor of recent years, has organised a blog tour and this tumblr in order for those of us who loved Diana, and her books, to share our memories. And so this is my contribution to that memorial, a(nother) tribute to the writer whose work has meant more to me than perhaps any other in my life. The flat itself is an add on. For the few years before I got married and moved up here, I’d lived in a bedsit in the same house—it was a room of the original house closed off with a kitchenette and the world’s tiniest bathroom stall, and lord knows how even then I managed to fit myself, my books, my boyfriend and my cat in, but manage I did. The house where bedsit and rooftop flat were is a magnificent Sydney California Bungalow, but twice as big as the average suburban Californian, rearing out of the garden on huge Sydney sandstone foundations, looking out, like an anchored and squat Castle, over an enormous, tiered garden and wild parklands that run down to the Parramatta River. I have so many stories from that house—stories of cats and possums and a rottweiler called Rommel, there on Her Majesty’s Pleasure until the landlady’s son was released and able to reclaim him. * It was in this house I learned the magic of the garden; where I learned that herbs love to soak the sun down to their roots; that tomatoes self-seed, and that you can break off an impatiens and stick it in the ground and it will continue to grow. It was here I first had total and complete responsibility for another life, or perhaps nine lives—my cat Bridie, rooftop dancer who lived to be almost 20, despite encountering in the next house after this her very own Throgmorten. Here that I started to think I was becoming an adult. And it was here I started to imagine the story of my own life—and without knowing it, at the same time, was growing away from the life my new young husband had imagined for us. People think that the books that shape you the most are the books you read in childhood. I am sure that’s true, I believe that to be true very sincerely, but it’s not true that it can’t happen also in your adult life. Because side by side with the stories I was living, were the stories of Cat and Janet and Gwendolen, of Tonino and Angelica, of Nan Pilgrim and Charles Morgan and Brian Wentworth and those girls with their dank-coloured knitting. And of Christopher Chant and The Goddess—Chrestomanci and his beloved Milly—and all the related worlds they—and I—inhabited. And though I didn’t know it at the time, they were to make all the difference. One of the most important aspects of writing a literature thesis, I think, is choosing a text (or texts, or author) that you can live with for a very long time—live with, read and re-read and never tire of and still find something new in it to exclaim over and ponder and then, at the end, to come out of the experience loving it as much, if not as more than you did on the very first day. The more time I spent with Diana’s books—I was also working on The Time of the Ghost and A Tale of Time City, trying to find an elusive thread between temporality in those books and Chrestomanci’s related worlds—the more time I wanted to spend, not just in Diana’s books, but in children’s books generally, including what we were only then just starting to call ‘YA’, absorbing them into my being, understanding them and the place they have in the world, and then bringing them back to the ones for whom they were intended. Of all four of the Chrestomanci books then written (this is a good decade or more before Conrad’s Fate and The Pinhoe Egg) that I was hoping to include in my thesis**, Charmed Life in the one I most clearly remember reading over and over again. In many ways, and despite the importance of The Magicians of Caprona for me personally, and no matter how much I love other DWJ books—The Time of the Ghost, Howl’s Moving Castle, Fire and Hemlock, that Chinese puzzle of a novel—I think if I had to choose a favourite Diana Wynne Jones book, then Charmed Life is it. It’s the one book I remember returning to over and over as I tried—and ultimately failed—to write that thesis the first time. It’s a book that now, if I pick it up, I can open at almost any page and find the words sing out to me as familiarly as my own voice. Then comes the Saucy Nancy disaster, the loss of Cat and Gwendolen’s parents, and the first of those many ‘great changes’ that come about. You don’t need me to recap the story—three pages in, we know that Gwendolen is a force to be reckoned with, potentially dangerous and without a shred of kindness in her. But if you have by chance forgotten, it turns out that Gwendolen is not, after all, much of a witch, but she’s smart and venal enough to have figured out that Cat is in fact an incredibly powerful nine-lived Enchanter, and she’s been sucking the magic out of him his whole life. She may indeed be the most purely, and deliciously, evil character in all of children’s literature—largely because she is still a child herself. Bad seed, indeed. It’s testament to Diana’s powers as a writer that we see all this through Cat’s eyes—he is the closely focalised third person narrative subject of the book, to go all thesis-y on you for a moment—but Cat doesn’t know it, doesn’t feel it, doesn’t understand it, until the final chapter of the novel. He’s the perfect, and perfectly drawn, naïve child protagonist, and Charmed Life is as an perfect example of how third person protagonist-focalised narrative can be as unreliable as any common or garden unreliable first person narration you can think of. Cat doesn’t get what’s happened to him—who he is, who Gwendolen is, what the implications of all of that are—almost until the very last page of the novel. And if you’ve forgotten the last page of the novel, just take a half hour and go and read the final two chapters. You might have forgotten some of the minor characters, and incidents, but don’t worry—you’ll be surprised how easily they come back to you. The final two chapters are set in the forbidden, magical garden outside of Chrestomanci Castle. Cat and Janet, the girl Gwendolen has displaced from a related world who everyone except Cat appears to think is actually Gwendolen (you understand—you’ve read it) have gone to the garden in a last desperate effort to return Janet to her own world—and for Cat to escape his miserable life and go with her. They’ve stolen dragon’s blood—Cat’s most daring and dangerous act—which will open the gates between worlds. It takes them ages to even enter this forbidden space—eventually, they have to stop looking directly at the place they’re aiming to be and come at it at a kind of an angle: “Try keeping it in the corner of your eye and not going straight to it,” said Cat. And when they do finally make their way in, the garden seems to spin and turn around them, through time and the seasons and space itself, as they move towards the gates at the centre of the garden, where Cat casts the dragon’s blood and the final battle (and yes, I use that phrase deliberately) begins, and eventually, ends. Of all the chapters of Charmed Life, the last two were the two I spent the most time going over and over, reading and re-reading when I was writing that first attempt at a Master’s thesis. And every time I found something different, something new, something surprising, something that made me understand this story in a whole other, deeper, more exciting way than the last time I read it. I’ve already alluded to one of the books that this final chapter has resonance with—The Lion, the Witch and the Wardrobe, of course. There’s the sacrificial stone and plenty of Christian allegory lurking around (when I put this to Diana in the interview I did with her in 1993, she exclaimed, Dammit! I’m turning into CS Lewis!). It’s rich with allusion and allegory—bread and butter for a youthful wannabe academic—but as I return to re-read the chapters now, I find it’s the mastery of the writing that impresses me. Diana’s writing is a bit like Cat and Janet’s journey to, and through, the magical garden. You can’t always come at it front-on—not if you want to really get to it, and get the most out of it. It’s not that her stories are inaccessible—though some are more opaque than others, and plenty of nervous adults have thought them too difficult for children. But they’re not easy, either. As Sharyn says, you have to have your brain turned on when you read Diana’s books. “I think it’s bored,” said Cat when he had shut the door. Cat was sure that if Janet did any such thing, she would come to herself to find the dragon browsing on her legs. I’ve never forgotten that phrase—browsing on her legs. How perfect, and yet how perfectly unexpected. How often, for that matter, has a DWJ character surprised you—surprised themselves, indeed, but surprised you, the reader, and who they turned out to be. Take Gwendolen, for instance. We know, as I’ve already noted, that she’s a bad’un from the start—but who would have predicted, in a children’s fantasy novel that is in so many respects so quintessentially English, that this wicked child would turn out, in fact, to be a sociopath who is completely willing to kill her own brother not once, but nine times over. (She’s already killed her parents, of course.) Who would expect that? And who would dare write it? Anyone who comes to a novel by Diana Wynne Jones thinking they’re knowing what they’re getting on any level is in for trouble. She destroys the arrogance of the good reader, by being better. Better at story, and better at knowing people and what they are capable of—their capacity for casual wickedness and stupidity as well as their capacity for great love, kindness, forgiveness and intelligence. Diana didn’t suffer fools, not gladly, not at all, and neither do her books. It’s not just that Gwendolen is allowed to be fully and completely evil—and get away with it. (Get, indeed, rewarded for it—she goes back to the related world where she’s a liveried queen, carried about by servants, or more likely slaves, bestowing largesse and punishment with equal arbitrary callousness.) No, it’s the end to Cat’s story that has always fascinated me. Cat has gone almost the entire novel without having the first clue that he is one of, if not the most powerful enchanter in the world. Worlds. You know what I mean. He finds out in the very final chapter of the book, when he and Chrestomanci have been captured by the pack of rebellious witches and warlocks, determined to destroy them so they can use their magic untramelled, to be as wicked as [they] want. It’s a crisis of unimaginable magnitude, and on Chrestomanci’s urging, Cat at last feels his magic—the magic he was looking for head-on his whole life, expecting it not to be there (Try keeping it in the corner of your eye and not going straight to it)—and there it is. It’s a stand-up-and-cheer moment; he releases himself and Chrestomanci, the forces of good from Chrestomanci Castle are summoned, and the battle is on—and won. But in all the action, Cat doesn’t get a minute to draw breath and absorb this new truth about himself. The last we see of him, he’s sitting on the grass, everyone has been enjoying the Blytonesque picnic that is, after all, the very English spoils of war, and the final conversation has been had that wraps up all the unanswered questions about who knew what when (with a nod to that other great English storyteller, Agatha Christie). And everyone else—with the possible exception of Janet—thinks everything is explained and fine and let’s go on to the next thing. But poor Cat—even in the very last sentence of the book, Cat is almost in tears—still a little lonely and fearful—and not understanding very much at all, really, about himself and what he’s just discovered and what his life is going to be like from now on. Really, what happens, is that Cat’s story only begins at the end of the novel. And I think that’s true of so many of the truly great children’s books. The great children’s novels gets the child through those high and wild narrative seas, fraught with danger and fear, and delivers them safely, but on some equally wild and rocky shores, safe but uncertain, hopeful but going into the unknown. In the great children’s novels, there is supper waiting for them (and it was still hot), but it’s not the end of the journey, as it was for Sendak’s (much younger) Max. The heroes of the great children’s books end their journey at the start of the new—adolescence looming, with all its terrifying promise of adulthood beyond. For the lucky ones, there are still adults there who will help them through; there’s family, if not the one they were born into, and friends, including siblings, whether real or Related…. The great children’s novels get the protagonist to enough knowledge of themselves and to the point where they are just equipped enough to embark on the truly wonderful and difficult journey to eventually separate from family. In all honesty, I’d never really thought this about children’s books (In my end is my beginning) before I started writing this post, and it’s a thesis I’m going to have to think about and test more over the weeks and months to come. Let me know what you think. Am I right, or did I just make it up? Huh. See what Diana did there? She made me turn my brain on. So whether or not I’m right about this, this I know I am right about: Charmed Life is a perfect children’s novel. I don’t think it’s a difficult book—it’s in some respects no more difficult than the succession of great 20th century children’s novels that come before it, none of which may be much read by the average reader, but are still cherished by what Farah Mendelsohn calls The Reading Child*** today as much as they ever where—but it does repay a thoughtful and intelligent reader. It is completely deserving of classic status, and is as simultaneously typical and marvellously ground-breaking an example of the great children’s novel as you could hope to find. I never did finish my thesis on Diana’s books. I kept working, kept trying to configure my brain to understand at the level I wanted to, and I was getting there… and then that young, short marriage ended and I gave in and filed away those rough and meagre chapter drafts and I concentrated for a while on surviving getting up every morning, and then on making that life in children’s books that, frankly, has given me more joy and satisfaction than I could ever have imagined. If you read the full transcript of my interview with Diana, you’ll see many traces of the areas I was interested in then. I still re-read that interview and am amazed and astonished by how generous she was, with her time, her thoughts and her imaginings. How lucky I was to have met her. How very much I miss knowing she is there. I confess that when I started out to write this post, I thought that it would be much more personal—a reminiscence of the time I actually met Diana, when she was here in Australia. That was a very precious experience for me, as was the occasional correspondence I had with her in the year or two after her trip here, and then, so sadly, in the months before her death. But I can’t claim an unusual personal relationship at all (although I often wonder if she did ever wear the marcasite dragon I sent her to thank her for the interview…) and really, in the end, as for most of us, my true relationship with her is through her books. And that’s about as personal as it gets—and I mean that very sincerely. Thanks again, Diana, for the books, and for this life. You will never know how far your legacy extends. Vale.